2016 (stage and discharge), October 2016 to current year (stage only). Geodetic Vertical Datum of 1929. July 1965 to July 22, 1984, at site 500 ft upstream at same datum (NGVD 29). higher (NGVD 29). 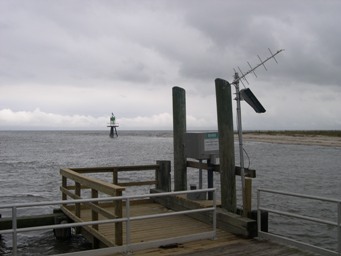 September 22, 2006 to September 30, 2009, at present site at datum 1.02 ft higher (NGVD 29). CRITICAL LEVELS.--Top of pier; 5.0 ft, information provided by U.S. Geological Survey. unknown. Maximum discharge, 11,200 ft3s, October 30, 2012; minimum discharge, -19,300 ft3s, January 23, 2016.
reached a stage of 7.97 ft (NAVD 88). Storm of March 1962 reached a stage of 7.96 ft (NAVD 88), from floodmark. COOPERATION.--Funding for the operation of this station is provided by the Delaware Geological Survey. Add up to 2 more sites and replot for "Gage height, feet, [NAVD88]"